I remember years ago when every house had the same basin design. They were all semi-circular in shape with space for two taps, soap and a full pedestal which made the basins a freestanding unit. Today there are such a wide variety of modern bathroom basins available from those with a full pedestal to those with a half pedestal and those that mount directly on the wall. Each one comes with its own advantages and styles, so you can easily find the one that best suits your overall bathroom design. Many homes still use the full pedestal modern bathroom basins because they are freestanding and if you don’t have room for a vanity, then these are a top choice. The advantage these days is that these modern bathroom basins come in a selection of shapes to blend in with any bathroom design. You can choose from square, rectangular, oval, semi-circular and modern options. They are all available in a brilliant white which helps keep your bathroom looking bright and fresh. 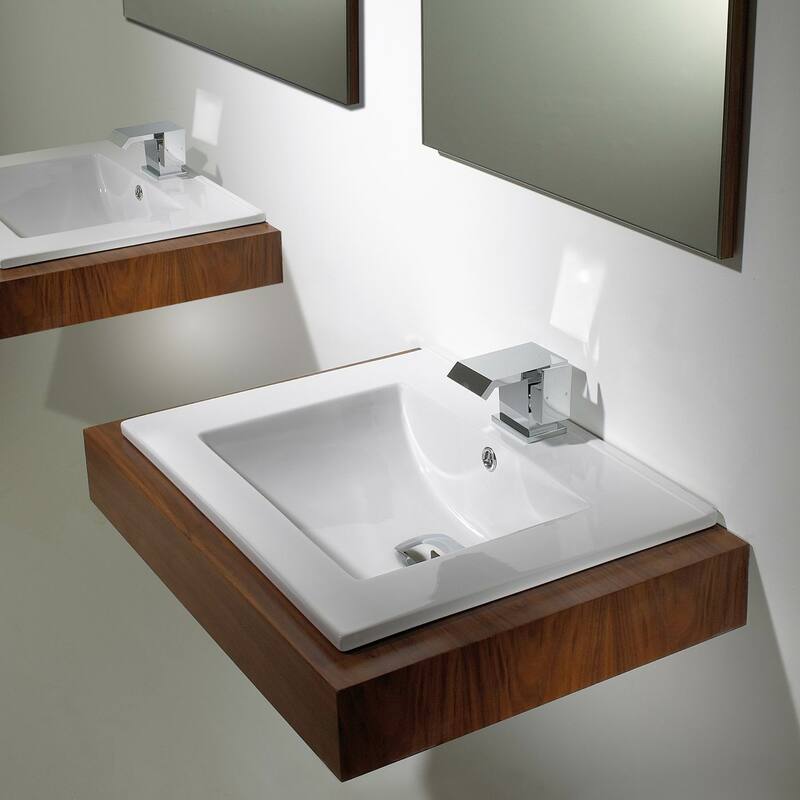 The half pedestal modern bathroom basins are a welcome addition in any bathroom size or design. These modern bathroom basins help you maximise floor space and while they still use a pedestal to hide plumbing they leave ample space below for any items, such as a small bin, you may want to place below. Again these modern bathroom basins come in a selection of shapes and sizes to blend in with any bathroom from the semi-circular design to the square and rectangular choices, there are even those specially designed for cloakrooms with the tap to the side to maximise space. Wall mounted modern bathroom basins are a great option for any bathroom as you can mount them to the desired height and are not restricted by a pedestal. The advantage to these modern bathroom basins, over and above the selection of shapes and sizes available, is that when combined with a polished chrome bottle trap they can really enhance the bathroom space. A rule of thumb that I always stick to when choosing modern bathroom basins is to ensure the shape I choose is the same shape I use throughout the space. So my basin shape is similar or the same to my shower, bath and toilet. Modern bathroom designs are increasing in popularity. Up until a few years ago the bathroom was just a necessary space in the home, today a lot of emphasis is placed on the bathroom and their design is as important as the kitchen or living room. When it comes to the bathroom, a modern, luxurious or spa-inspired bathroom can impact on your home’s value, in fact having a stunning and functional bathroom space can increase the value of your property and make it more appealing to prospective buyers should you ever decide to sell. A modern bathroom design doesn’t need to be minimalistic. Of course if you want a minimalistic design use plenty of white, chrome and glass with straight edges, such as rectangles and squares. Modern bathrooms can use both straight and curved edges in their design. One of the best options for a modern design is the counter top bathroom basins. These basins sit on top of an existing shelf or vanity and come in a selection of shapes and sizes to blend in with any bathroom décor. The counter top bathroom basins ooze elegance and sophistication and are a welcome addition to any bathroom design. Then there are the baths, from the magnificent freestanding baths to the slipper baths. Bear in mind that your counter top bathroom basins and bath should be a similar shape, you want to carry the same design throughout the space. Once you have chosen your larger bathroom products for your modern bathroom design and have chosen counter top bathroom basins there are a few things to take into consideration. The first thing you will notice is that not all the counter top bathroom basins have space for a tap. This means that you will need to mount your tap on the wall above the basin, though this can add that final touch to your modern design. Be careful to choose the right size counter top bathroom basins, there is nothing worse than having a tiny basin in spacious bathroom area or a large basin in a small bathroom space. Take the measurements available into consideration to ensure your counter top bathroom basins enhance the space. You may not realise what a pivotal role your bathroom basin makes to your overall bathroom design. These days your bathroom basin is a centre piece in your overall design, which is why it’s so important to find the right one that will blend in and enhance the space. Glass bathroom basins are not only elegant and sophisticated, but they are a welcome addition to any modern bathroom design. These basins are manufactured using toughened glass. What this means is that they don’t chip as easily as you may have thought. Another advantage to the glass bathroom basins is that the modern bathroom filled with glass, chrome and plenty of white always makes a statement in any home. What you need to remember is that these days it’s important that your bathroom reflects the design of your home and it can increase your property value, making it more appealing to potential buyers in the future should you ever decide to sell. Another fantastic addition is the glass bathroom basins that come as a unit that includes chrome legs and glass shelves, perfect for the more compact bathroom or en-suite design. Counter top basins are very similar to the glass bathroom basins in that they will sit neatly on the counter or shelf offering that “wow” factor that you are hoping to achieve. They come in a range of shapes and sizes to blend in with any bathroom design. It is so important that you ensure you carry the shape throughout your bathroom. For example, if you have chosen a bowl bathroom basin then you need to ensure that your bath, shower and toilet are all curved. Another example would be if you have chosen plenty of straight edges, then choose bathroom basins that are square or rectangular in design. Inset basins are very streamlined, they sit flush with your shelf or counter top adding sophistication and style to your design. These basins, like the glass bathroom basins, come in a choice of sizes and shapes to help you find the right choice for your bathroom. What I always suggest is look at the bathroom products you have already chosen, maybe you’re aiming for an ultra-modern design or maybe you prefer the more traditional style. If you have already chosen plenty of chrome and glass, then choosing glass bathroom basins will just enhance the space. I remember when a bathroom basin was an ugly product that stood against the wall with a full pedestal, these basins still look good in a traditional or cottage style bathroom, but with modern bathrooms being the top choice these days, inset basins work better, enhancing the space. To explain, inset basins sit within a counter top or vanity. The easiest way to describe them is that the sides of the basin are just above the vanity or counter top. The basin itself sits inside, this gives a stylish and elegant feel to any bathroom space. The best thing about these inset basins is their modern design. They are usually available in square or rectangular designs, which really compliment a minimalistic or modern bathroom. You may be wondering why inset basins would be the best choice for your bathroom. It’s easy to see that they are stylish and will blend in with any modern design, but what else do they have to offer? The first thing you will realise is how they can help you maximise your floor space in your bathroom, this is such an important step when working with smaller bathrooms. 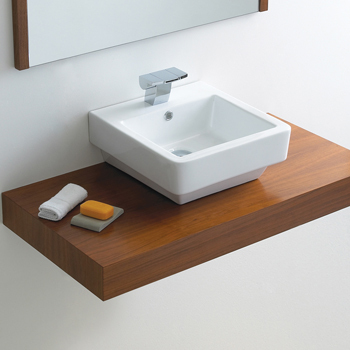 Because the basin sits within an existing vanity or counter, you are not taking more space away to fit your basin. All bathrooms benefit from having an abundance of space, of course this isn’t always practical especially these days when we are all dealing with smaller bathroom designs, using inset basins over full pedestal modern bathrooms, just helps you get that extra space that your bathroom needs to feel spacious. The greatest thing about inset basins is that they don’t need a pedestal, all you need is modern taps that blend in with your bathroom design and a bottle trap. Now don’t worry, I’m not talking about the ugly plastic bottle traps you find in your kitchen cupboard. The bottle traps available for the inset basins are stylish and finished in chrome, which adds to the sophistication of the space. Another advantage is that if you are mounting your inset basins on a counter top, you can leave the bottle traps on display without concern, it will help add to that modern feel you are trying to achieve and ensures you have ample space below the counter at the same time. There is such a wide selection of bathroom basins available on the market today and this can make the decision on which one to add to your bathroom a very difficult one. With such a wide selection to choose from, you should embrace the ability to find the one perfect match that will complement your bathroom space, rather than feel frustrated that there are just too many to choose from. Years ago you had one choice, the traditional basin with full pedestal. Where was the excitement in that? Today there are counter top bathroom basins, inset designs, modern choices, glass options and wall hung styles. Designing a modern bathroom has never been easier. Counter top bathroom basins have become a very popular choice. These can be mounted on top of a counter or a slab, depending on how you have designed your bathroom. These basins are available in a choice of modern designs from the stunning rounds to square designs or even the bespoke designs. These counter top bathroom basins blend in with any modern bathroom design and can make a great statement to the space, adding elegance, sophistication and style to any bathroom. 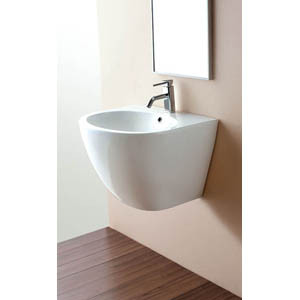 The glass basins are also a popular choice and a good selection for smaller bathrooms where you want to maximise light. These basins are made to the highest quality and are exceptionally durable, which means they will not break when you place hot water in them. These glass basins are available in a similar design to the counter top bathroom basins where they can be mounted on a counter top or slab to make a statement in your bathroom. The biggest advantage with counter top bathroom basins is that you don’t have to have that full pedestal any more, the plumbing can be added in the cabinet below or you can use a bottle trap that is minimalistic and makes cleaning the bathroom easier than every before as there is nothing under the basin so you can just swipe it with the mop. For a stylish modern bathroom design choose your counter top bathroom basins to match the shape of your bath or shower enclosure, if you have chosen square with straight edges, stick to the design. The same applies if you have chosen an oval bath or a shower enclosure with a curved edge, choose a round counter top bathroom basin to blend in with the space. Whether you are searching online or you have wandered from store to store looking for a bathroom basin, there are a few tips that can really help you find the ones that best work with your bathroom design. The first thing you should do before you even start looking at bathroom basins is to put a budget together. If you are remodelling your entire bathroom, set your budget for each item you need, this will make it so much easier when it comes to what is available for you. While there are many different types of bathroom basins, they vary in price. Having a budget can reduce your search, making it easier to find the perfect basin for your bathroom. Bathroom basins don’t only come in one design, there are plenty of them and you need some idea of what you are looking for. Modern bathrooms will look spectacular with inset basins while the modern traditional bathroom may benefit from wall hung or modern basins. Whenever you are looking at the basin designs available you need to ensure they will blend in with your current bathroom design, they will work with your bathroom products you have already chosen and most of all, they will make a statement. The inset basins not only make a statement, they are modern and exceptionally stylish and will definitely become the talking point of your bathroom design. They are easy to install and recessed into a worktop, they are minimalistic and sophisticated. While design and budget are very important when looking for bathroom basins, practicality is just as important. You need to look at how practical the basin is in your bathroom. For compact bathrooms inset basins can be the best choice, they reduce the amount of floor space you need, making them a very practical choice. Every day people make mistakes when choosing their bathroom basins, it’s easy to think that a basin will work but once your bathroom is completed, your basin doesn’t do the room justice. This is why you need a plan, a bathroom layout and a vision. Being able to imagine your completed bathroom will help you make the right choice, carrying the same style throughout your bathroom really helps. Choose inset basins when you are designing a modern bathroom, ensure your basin works with your toilet and bath, choose your taps to match throughout and enjoy the finished product.